This Resource Guide is intended to assist participants in the Third Review Conference for the 1993 Chemical Weapons Convention. 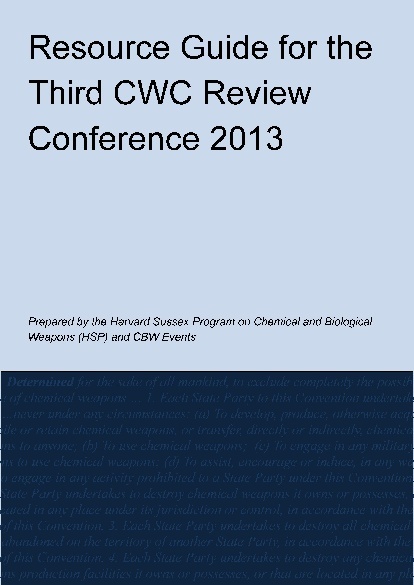 The Third CWC Review Conference will be held from 8 to 19 April 2013 in The Hague. The Resource Guide contains relevant key documents. This volume follows a similar layout to the earlier briefing materials prepared for the 2008 CWC Review Conference and recent Review Conferences for the Biological Weapons Convention. This website also includes additional material that could not be included in the printed volume owing to space limitations. As the Conference progresses, the Organization for the Prohibition of Chemical Weapons (OPCW) will be posting documents to a dedicated Third CWC Review Conference page on its website. 2013 CWC Resource Guide by document which includes links to the individual documents. Where readily available, copies of documents are also provided in other languages. The CWC 2013 Resource Guide has been prepared by James Revill and Caitriona McLeish of the Harvard Sussex Program and Richard Guthrie of CBW Events with financial support from the United Kingdom Foreign & Commonwealth Office. The authors and sponsors welcome feedback; a form for this purpose is available in Word and PDF formats.